Posted on December 19, 2014 at 12:26 pm. Playing slots at any of these secure venues is 100% legal and above board, so Aussie’s can rest assured that these games are legitimate and offer authorised, real money prizes. The life-changing mega jackpot, which is always in excess of $1,000,000 AUD, was won back in 2009 at a record high of $6,374,434 – the lucky gentleman known as Georgios M played a five Euro spin which made him that much richer. And who said there is no decent money to be won in pokies? That figure is enough to make the high rollers run scrambling for a computer. 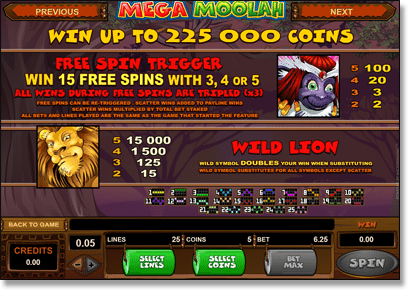 For those not familiar with Mega Moolah, it’s a Microgaming pokies classic that’s been around for years, and consists of four different progressive jackpots. The mini jackpot starts now lower than $10, increasing to the minor jackpot of $100+, then the major jackpot starts at $10,000, with the highly sought after mega jackpot beginning at a tasty one million dollars. Unlike many other progressive jackpot pokies that require players place the maximum bet to be eligible to win the jackpot, the Mega Moolah jackpot can be won for as little as 25 cents. However, betting larger stakes per spin does increase the chance of triggering the bonus round, which is where we win the jackpots (courtesy of the jackpot wheel). Recreational and low wager punters certainly remain in the prize pool, though, which definitely adds to Mega Moolah’s appeal. All lines must be played to trigger the jackpot and a maximum bet of $6.25 is available to play. It’s not just the jackpot bonus that makes Mega Moolah so highly lucrative. Added features bring in even more chances for a sumptuous win, with Free Spin rounds that triple all wins, activated by the Monkey scatter which can pay up to 225,000 coins, and a Wild Lion feature that can pays out up to 15,000 credits for five of a kind, doubling any win it completes. Mega Moolah follows an African theme which is visually pleasing, combining vibrant colours with friendly animals to make for an enjoyable and lively game. The light-hearted gameplay and simple format of Mega Moolah makes it highly appealing to all pokies players, new and experienced, with those huge jackpots drawing in hopeful players from across the globe. Let’s Make the Winner an Aussie! Players are hungry for a pre-Christmas miracle as the mega jackpot is quickly approaching that stunning $3,000,000 mark. Mega Moolah is available online on desktop computers and all smartphones and tablets, so you can try your luck at the big bucks on the go using your mobile device. Brighten up your Christmas shopping nightmares with a side of million dollar potential by playing Mega Moolah while waiting in those hellish lines or while stuck in traffic. We’re looking forward to seeing how high the jackpot reaches before a new millionaire crowned, and would love nothing more than to see it go to an Australian punter. As more players head online to spin the reels of Mega Moolah, the jackpot grows by the minute, so don’t miss your chance to be in the running for that win you deserve. Each of our recommended sites follow strict regulations within the casino industry and support responsible gambling practices. The range of payment options on offer means Aussies can play for real money using a payment method that suits them, in Australian currency, with the peace of mind knowing the transactions are safe and legal.